A Republican super PAC is reserving $8.1 million worth of TV ads in the North Carolina Senate race, a definitive signal that the once sleepy contest between GOP Sen. Richard M. Burr and Democratic nominee Deborah Ross has become a major battleground. The ads from Senate Leadership Fund, a group connected to Senate Majority Leader Mitch McConnell, will begin Sept. 13 and run through Election Day. Republicans are nervous about the North Carolina contest, which features an incumbent, Burr, who has been outraised in consecutive fundraising cycles by the relatively little-known Ross, a former state lawmaker. The race is rated Tilts Republican by The Rothenberg & Gonzales Political Report/Roll Call. Even more of a concern has been the potential drag on the ticket created by Donald Trump, whom polls show is running in a dead heat with Hillary Clinton there. Clinton&apos;s campaign has made North Carolina a top priority, investing in a ground game and spending heavily on TV ads there. But GOP operatives believe that Ross, former state director of the American Civil Liberties Union in North Carolina, has a target-rich record, which they plan to exploit in the coming weeks. 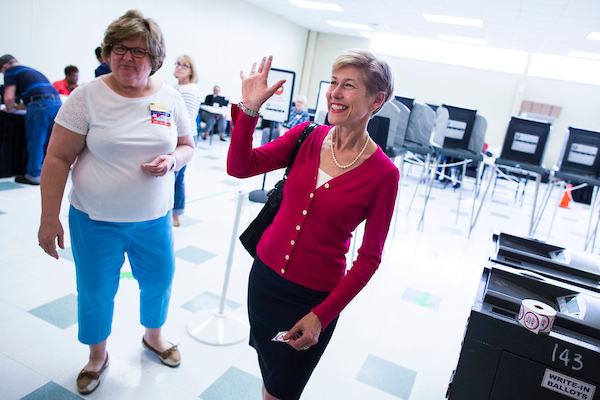 “By the time Election Day comes around, North Carolina voters will know more than enough about Deborah Ross’s record to make her unelectable," said Ian Prior, spokesman for the PAC. Democrats consider the race less of an opportunity than contests in Illinois, Wisconsin, Indiana, New Hampshire and Pennsylvania, but believe they have a real chance to win a race that was on few people&apos;s radar when the year began. Democrats struggled to recruit a candidate to run against Burr, being turned down by former Sen. Kay Hagan, former Rep. Heath Shuler, and a handful of statewide Democratic officials and legislators. One Nation, the nonprofit arm of Senate Leadership Fund, announced a $1 million ad campaign in North Carolina last week. In a statement, a spokesman for the Ross campaign said Burr was being bailed out by the same wealthy interests he&apos;s favored while in office. Contact Roarty at alexroarty@cqrollcall.com and follow him on Twitter @Alex_Roarty.